* Join us! The 2018-2019 SEP program registration is open now. * Great news – we received The Tan Family Education Foundation donation $6000. Thanks to teacher Tan Jialing continuous support and generosity to SEP. We are very much appreciated! SEP 2018 China trip team will attend school Parents Assembly and the team representative will share their story at 3:40pm, June 17, 2018. Please come join us for a great informative session if you are interested to know more about SEP China trip. See you at NCLS school auditorium. Newton Chinese School Support China Education project has entered its 12th year. Every year, the working group organizes a series of activities for fund-raising to support Chinese high school students who are outstanding but need financial help. The Youth and Family Fundraising Talent Show plays an important role. We welcome individuals, families, and groups from NCLS as well as the surrounding area to participate in the show. All proceeds will go toward the 2017 – 2018 Support China Education program supporting underprivileged high school students in Xin’an Yizhong, Henan province. The talent show is also a great platform for selecting excellent performing program to qualify for NCLS in-school or out-school New Year Gala and other performance opportunities. Let’s share our talent, enthusiasm and work together to support this meaningful course. You can make a difference! Due to the strong support of the community from NCLS teachers, parents, staff, working group members, The Tan Family Education Foundation and communities surround Boston area, NCLS Support China Education Project (SEP) has become a well-known community service program. We are incredibly thankful for your generosity, just last year alone, the SEP program was able to assist 30 high school students from disadvantaged families at Yuci Erzhong to finish their high school. You have made huge impact on those lives. As we start the new school year of 2017 – 2018, the NCLS Support China Education Program has kicked-off its planning phase during the summer. This marks the 12th year of the Program. This year we will be providing support to students at Xin’an Yizhong, Henan province (河南省新安一中). More information about this school and the students will be made available on the NCLS web site. Working Group Member Recruitment – To make this year’s program successful, again we are recruiting new working group members. The number of members is not limited. Any parent, teacher or staff who is interested in supporting and contributing is welcome to join us. The working group members are all volunteers, but we do need certain amount of commitment from you as a team member, please take a look at your schedule before you apply. We will run a series of fund-raising events and activities, have meetings and organize the students’ trip to China. If you are interested, please send an e-mail to supporteducation@newtonchineseschool.org before Saturday September 30, 2017. 2017 China trip team presentation – Support Education Program Working Group will host a presentation by 2017 China trip team on September 24, 2017 at 3:45pm in room 325 (TBD). Please come and join us for an info session. Our students will share their experiences and stories at Yuci erzhong, Shanxi province, this presentation will help you to understand more about this program and we will answer any questions regarding the program you have. Thank you! We appreciate your continued support and look forward to another successful year ahead! NCLS Support Education Program is celebrating its 11th anniversary! With all of the group members’ tireless and selfless contributions and efforts, NCLS board leadership, parents and teachers’ support and students’ participation, this program has become one most prominent community service programs in Massachusetts. You are cordially invited to join this year’s fundraising dance party on March 25th, 2017! Come for a wonderful night celebrating the coming of spring, and have fun! Contributions to the SEP cause will go the impoverished families of Shanxi province. Come support our local community in promoting education in China. SEP works to help those in need. Each year, student participants work to raise money for provinces in rural China; this year, the students will be taking a trip to the Yuci middle school. This trip serves to allow our students to be immersed in Chinese culture, learn about their own environments in contrast to China’s and to better help those in need. If you have any questions regarding the dance party or the SEP program, please contact Yan at yyan5221@yahoo.com or Ginger Yao at gingeryao@gmail.com. Please see the party details in the attached flyer. Newton Chinese School Support China Education project has entered its 11th year. Every year, the working group organizes a series of activities for fund-raising to support Chinese high school students who are outstanding but need financial help. The Youth and Family Fundraising Talent Show plays an important role. We welcome individuals, families, and groups from NCLS as well as the surrounding area to participate in the show. 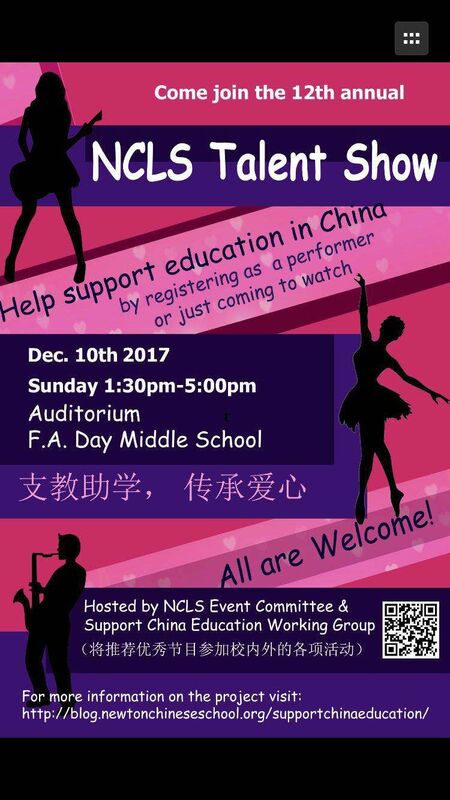 The talent show is also a great platform for selecting excellent performing program to qualify for NCLS in-school or out-school New Year Gala and other performance opportunities. Let’s share our talent, enthusiasm and work together to support this meaningful course. You can make a difference! The 4th Tennis Tournament in October ! 1. Registration begins immediately. 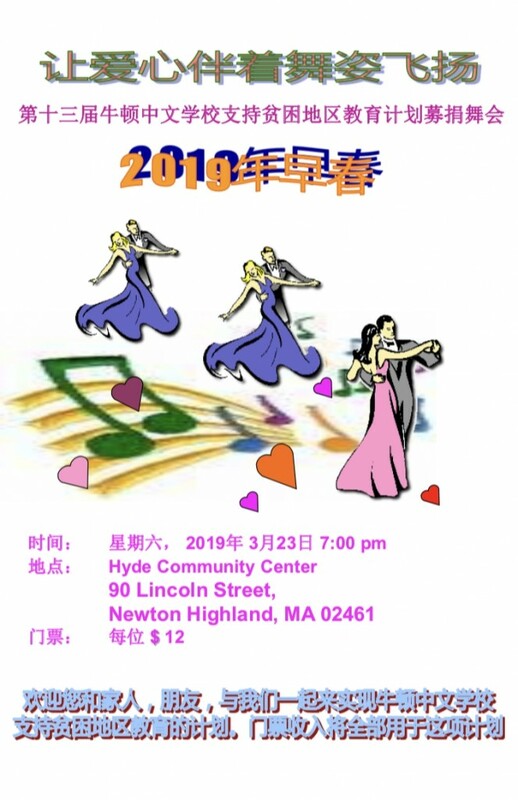 You can call/email/text/WeChat Mingshi Dai (戴明时) at (978) 930-2992,mingshi_dai@yahoo.com or Jackie Zhou (周津平) at 617-538-4318, jackiejpzhou@yahoo.com. Let us know your level, email address and phone number when you register. All matches will be played at Newton FA Day Middle School and Newton North / South High School courts over 2 weekends: 10/8– 10/9 and 10/15 – 10/16. Rain date: 10/22-10/23. · Men’s Singles A Group (USTA level 4.0/4.5 only): Pro sets. Best of 3 sets. The 3rd set is a Coleman 10-point tie-breaker. (Players in the A group will be designated by tournament organizer based on self rating and player tournament history). Matches for this group will be self scheduled at challonge.com. · Men’s Singles B Group: One set with 7 point tie-breaker if games tied at 6:6. · Women’s Singles: One set with 7 point tie-breaker if games are tied at 6:6. · Doubles: One set with 10-point tie-breaker if games are tied at 6:6. 3. Registration will be closed on 10/6. Draws will be announced on 10/7. Please contact Jackie Zhou (周津平) at 617-538-4318 if you have any questions. With the strong support from school parents, teachers, staff, working group members, The Tan Family Education Foundation and the communities surround Boston area, NCLS Support China Education project become very popular. We have celebrated our school 10 years successful Support China Education project in June this year. More parents and students would like to join the team, to contribute their time and to help the students in China who has financial issue but eager to learn. We are also forming a student volunteer group again this year. Every NCLS student above 8th grade is eligible even if you are not planning to go on the trip to China in April and your volunteer hours will be recognized. For those students (9th grade and above) who would like to apply as a member to go to China in April 2017, volunteer work prior to the trip is required. We especially welcome our program alumni to volunteer again this year as a way to give back to the program. Support Education Program Working Group will host a presentation by 2016 China trip team on September 25, 2016 at 3:45pm in room 325, please come and join us to share all the interesting and meaningful stories from our students. This presentation will help you to understand and know more about this program. We will also answer all your questions about the program. Thanks and we are looking forward to working with you!